TEECH visited Romania and Moldova from the 29th December 2012 to 13th January 2013 to hand deliver shoebox gifts and food parcels to children and families. The trip really started months before the 29th December, when we launched the appeal and were amazed at the response, receiving over 1,500 shoeboxes therefore both the vehicles we took with us were well loaded! After spending the night at a Travelodge in Ramsgate due to the early start today, we set off for the docks at Dover to collect the paperwork for the lorry before checking in for our sailing. The weather today was very windy so we were unsure whether the sailing would be delayed or too choppy to keep our breakfast down, but in the end we sailed only half an hour late and the full English we had on the boat stayed where it was supposed to for all of us. Today we would be on the road travelling through France, Belgium and Germany. As we travelled across Europe the weather calmed and it didn’t even rain in Germany when I am told it always does on every TEECH trip. problems with their car park cracking we could no longer park the lorry there and had to move it to a compound next door to the hotel overnight. After a few beers we were all tired and headed to bed for a well deserved rest. We were up and had breakfast by 7am and found it was much colder today (not helped by the cold shower because I didn’t leave it to run for long enough first!). There was snow but luckily not on the roads. Our first stop of the morning would be in Tileagd where we delivered boxes of material for the ladies ("Flowers of Tileagd") who make bags to sell. The bags are taken back to England to sell and raise income for the ladies of the village (we would stop there on our return home also to pick up finished bags to bring back to the UK). From there we would travel across Romania towards Targu Mures. Through the villages it was pretty to see all the snow but have the advantage of it not being on the roads. In the trees you can see mistletoe growing in large clumps where the rest of the tree is just bare. Once we arrived in Targu Mures we met up with Zoltan who had come to meet us so we could then follow him to his village of Maiad. 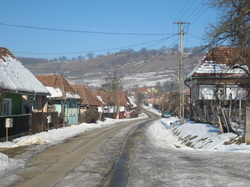 TEECH first came to this area of Romania in 2006 to carry out projects at a number of buildings, including installing toilets. This part of Romania is called Transylvania and consists of Hungarians (as it was once in Hungary), therefore Zoltan and his family (and the village of Maiad) are all Hungarian. 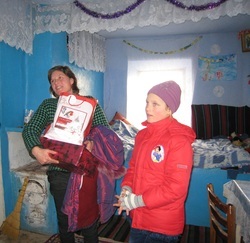 On arrival at his home we met with his wife Ancy and their young daughter Boroka (see in picture). We were looked after very well, being given soup and bread, followed by mashed potato and pork with gherkins and chillies for dinner. Even though they have an indoor toilet in their house Cookie and Holly felt obliged to check out the outside one up the garden. Even in temperatures below freezing it was not so bad (once we got to it....sliding on the ice) and its good for us to experience what most people use on a daily basis. After the meal we went to meet Ancy’s parents, just a short walk down the village, where we were welcomed with wine and Polinca (vodka). A nap was required back at Zoltan’s house so that we would be awake at midnight as it was New Years Eve. We would celebrate three new years, the Romanian one at midnight, Hungarian one at 1am and then the UK one at 2am....by which time we were all very tired. slowly building his family a house of their own, but this is taking him many years as only parts of the house get built when spare money is available. In the summer Zoltan goes to Holland to work for six weeks to earn extra money for his family. When we got back to the house Ancy had prepared food of cabbage rolls and bread for lunch before we would set of for Comanesti. We would arrive in Comanesti about 9pm where we would be staying for one night at the Robert Cole Centre, a centre which TEECH had completed work at in 2009. We all had an early night as we knew the next day would be busy once again. The day was spent in bed! Holly was feeling the effect of local food on a stomach that is not used to it, therefore missed out on the adventures the rest of the team would encounter. Rob, Cookie and Wendy would go out into Comanesti and visit many people they had seen before, including Ana and her children and a young blind girl called Sarah (seen in picture), giving them all gifts and catching up since the last visit. In the afternoon we would travel onto Targu Frumos to stay the night at Hotel Coroana. The drive up there was slow due to the fog but we arrived safely and by this time none of us were feeling particularly well and had an earlier night. Time to venture into Moldova! We were up at 6am so we could get to the border early, as we never know how long the process may take. We would be crossing at the main border at Albeita. The van sailed through the Romanian and Moldovan borders very easily, but there was still something new to do at the border. This time we had to buy a vignette for Moldova which has not happened before. The lorry would take about an hour and a half to get through the border but this was still a good time. Once across we travelled in convoy with Slavic (our Moldovan contact) into Chisinau the capital to the ‘Vama’ (customs) as paperwork still had to be completed for the lorry and the lorry checked of its contents (at the border they put seals on the lorry and these are removed after a visit to customs in the capital). 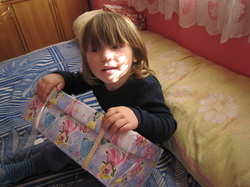 Once customs was cleared we travelled to Veronica’s (A lady with a charity called Ora International in Moldova who provides help to TEECH when we are in the country). We would be staying at Veronica’s B&B for a few nights. We were once again well looked after and had a late lunch before heading off to sort out shoeboxes from the lorry on to the van in preparation for the next day. We were up at a reasonable hour (7.30am) to shower and have breakfast before a long day ahead. Breakfast was pancakes (small and stout, rather than thin and flat! 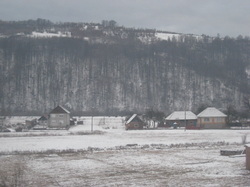 ), then we set off with Slavic to pick up the van and head to the village of Zberoaia. The village is on the border with Romania and the school currently has no indoor toilets therefore we would not only be there to give gifts to the children, but also look at whether TEECH can help the school in the future. The road and scenery to the village was very pretty due to all the snow, but you could still see a lot of the vineyards planted in fields beside the roads. The main roads were clear but the small roads covered in snow and ice, so we at least got some good use from the vans winter tyres. At the village we were welcomed by the Mayor and the Director of the School. We unloaded the presents into the school hall with the help of some of the older children, before we could distribute them as they waited patiently. classrooms which has desks and chairs from Sprites School in Ipswich, England (See photo gallery). Wendy and I visited the current toilet facilities which were outside and too much for us. We can handle an outside toilet but these were too dirty and far too smelly to consider (and this is winter time! ), therefore we made use of the snow behind the small outhouse building!!! We were treated to lunch of chicken soup, wine, coffee, potatoes, various meats, cheese and pumpkin pancakes. After eating we would look at the classroom where they would like to install indoor toilets for the children within the school. (Once the summer project is decided then we will let you all know and further information will be on the website). The day had flown by and it was nearly 5pm and we still had another project to visit. We headed off to Carpineni, but as Slavic was unsure of the way we had to stop a few times to ask for directions. It was dark by the time we arrived at the orphanage where we were greeted by the director. Firstly we sat with the director and he explained who he was and what requirements the orphanage needed and we explained to him who TEECH are and the aims of the charity along with the work which we do. He also explained that the number of children at the orphanage is increasing as the local population is mainly elderly, children and men, as the ladies are leaving to work in other European countries. The children then gathered in the main hall and we were welcomed with singing and storytelling, before we gave them their presents and woollen hats (thanks goes to many people who have knitted items for TEECH to distribute). The orphanage does currently have indoor toilets but these could be vastly improved and proper drainage with a septic tank is needed, along with new pipe work throughout the buildings. There are two buildings for sleeping, one for girls and one for boys, but in the winter all the children sleep in one building to reduce the heating bill. We were shown the room where the boiler is....this is no ordinary boiler, it is huge (see photo gallery) and has to be fed with coal regularly....Cookie gave it a go but I'm not sure he would be given the job. They also showed us the canteen which can seat 300, which stems from the days it was built when Moldova was under Soviet control. Whilst being shown around the kindergarten section of the building some of the younger boys came back with their shoeboxes and were very excited to see us again, wanting to be picked up and receive some attention. By 8.45pm it was time for us to leave and head back to Chisinau for the night. Today we were treated to our best breakfast yet. Veronica arranged for us to have porridge, ham, omelette and toast, which we considered to be a real treat, so we were well set for the day ahead. Following breakfast we headed off to pick up the shoeboxes from the lorry, taking about 200 to the school at Valcinet. The drive to Valcinet was rainy but quite quick, and on route we saw many vineyards (Moldova produce a lot of wine!) and some men on a lake fishing. The lake was frozen over, but they had walked out onto the ice and punched a hole through the ice for their rods and sat on a small stool fishing. At Valcinet we were greeted by the Mayor and the Director of the School who we sat and chatted to for a good hour or two, discussing our trip, what the school had been doing since our summer project (they had received a grant and had some windows replaced) and also discussing how the Mayor would like to educate others about the western European way of doing things to make further improvements to the school and to others in his district. The Mayor gave us all wine and chocolates, but we were unable to see any of the children so we had to leave the shoeboxes at the school for when they would return from the school holidays. We took a look around the school and saw that the toilets we had installed in the summer were being used and were well looked after. We also ventured outside to see that the children had decorated one of their outside shelters (see picture). In the summer the TEECH volunteers had decorated three of them and the children were so impressed they wanted to do the last one themselves. It was great to see that TEECH had inspired them to do this with their teachers. Once we left Valcinet we returned to Chisinau for dinner at Veronica’s, where we would again be fed well on fish and chips and pickled cabbage. bread and wine (they like their alcohol in Moldova), but we were also treated to hot kidney and potatoes (I say hot because alot of the time the food is presented cold). We presented the school with a wooden toy box which had been made by and donated by a gentlemen in England. The toy box would remain in the community room for the kindergarten children to use. We walked back down to the village and visited a few families in their homes to give them warm clothing, blankets and food parcels. The first lady we visited was pregnant and had one young girl (about 7yrs old), but she was single (in picture). She had run out of coal to keep her small house warm or to cook with. We were able to give her a food parcel, a shoebox present for her daughter and some clothing and blankets to help with the harsh winter. The other family we visited was a couple with two young girls and very little so it was nice to be able to give them food and some new shoes. invited us in for tea/coffee and cake which was kind of them. One lady was from India and one from Germany so we had a good cultural mix around the table. they use the same tunes as us! Even though it was very cold and dark (a head torch must be in the top 5 items needed for a eastern European trip) it was one of the most enjoyable parts of our trip. From there we would travel up to Balti where we would be basing ourselves for the remainder of our trip. By the time we arrived it was midnight because we had also needed to drop the lorry off at a safe location, where it would stay and we would just stop off to unload what we required each day. We were all ready for a good night’s sleep by the time we reached our destination. Due to our late night we had a lie in this morning, plus it was felt that we could not visit anyone during the morning as it was their Christmas Day. Once up we ventured out on foot to find the local shop. Luckily we found one not far away and bought enough food for a feast. We purchased eggs, cheese, butter, bread and ham for our breakfast. Wendy cooked for us and we had a lovely Christmas brunch. Slavic arrive with his friend Vova at lunchtime and we went off to deliver parcels to the poorer families in the outskirts of Balti. The main roads around the town were clear but the side roads again like mogal hills (even without snow the roads are not in a condition you ever experience in western Europe). One family had a young albino boy who clearly had little eyesight as he examined all the items in his shoeboxes with great care, holding them up close to his face. We gave the mother a food parcel which she went through with great excitement. Their home (just a couple of rooms) were very warm but they seem to have cats sitting on the stove to keep warm. It is unusual to see pets in homes in Moldova, they never have their dogs indoors even when it is cold. At another family we gave a young girl of about 7years a shoebox and she slowly opened it, peeked inside and then quickly closed the lid as if she shouldn’t have looked. She then laughed and smiled and re-opened the box to see what she had, saying ‘wow’ as she did it. Following our visit to many homes we went back to the lorry to sort through more boxes and re-load the van, to enable us to visit some more families late afternoon. As it was Christmas day alot of families had gone to church later in the evening so we stopped to eat ourselves, before an early night. Falesti would be our destination today to visit the children at the orphanage. It did not snow during the day but there was snow drifts across the roads meaning the snow plough’s were out and it was quite windy, but never deterred we reached the orphanage to visit the children. We spent a couple of hours with them and you could tell they were excited to see us and be able to spend time with us, looking at the items in their shoeboxes, tying to teach a few of them to juggle and doing a bit of arm wrestling. visit more families. 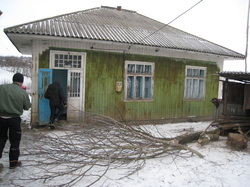 We would leave Slavic with clothing for the Rehabilitation Centre which he would deliver after the snow had cleared. 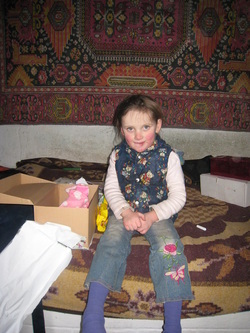 We were lucky enough to visit a lady called Tatyana who we had first visitied last year. She is a single mother with twin boys (3yrs) and two older girls. She can not currently afford to pay for electric and has limited wood to burn to keep the home warm therefore their home was very dark when we visited. The children were excited to see us as they had been warned that we were coming. We were able to leave them with some food and even a wind up torch to make things a bit easier when it gets dark. Later that evening Slavic managed to get his car stuck in the snow, so we had to tow it out with the van, before we went to Vovas flat for dinner. His wife Julie had prepared a lovely meal of salads, bread, chips and pork with mushrooms and melted cheese on top. Later in the evening we returned to where we were staying and Romeo came round to visit. 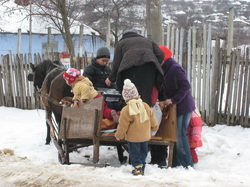 Romeo supports and used to help TEECH when the charity first ventured into Moldova. We were up to leave by 8am as we needed to go and load the van before heading north for the village of Mihaileni. We would be delivering aid today for a lady called Victoria Dunford, who is Moldovan but now lives on the Isle of Wight. We took aid to her village as well as going to look at the school there as a potential future project for TEECH. We travelled up there on the snowy road and it felt very cold today (minus 11 during the day). We were met by the mayor and the director in the village and our first port of call was a toilet......which was only a long drop type outside, which was a quick event in temperatures like those! The school we looked at is for 400 children where they currently have no functioning indoor toilets. There are rooms which used to have toilets but all the pipe work needs replacing along with new sanitary ware and a septic tank for the waste. We were then invited to the Mayor’s office for coffee and biscuits where we met with the social worker from the village. She, along with the mayor would accompany use (split into two groups) to visit families in the village. All the families we visited were clearly very poor and the village roads only just passable by car. girl were living in a very remote house (next door to their original house which had burnt down). The young girl was clothed but her clothing very warn and her toes sticking out of her tights, so she must have been cold. After making all our visits we went to Victoria’s mothers house for dinner. The food was plentiful and there was no way we would get through it all. The Moldovans like to put on a spread and we were all stuffed by the time we left, but it was very lovely and we were made to feel most welcome. Again the van would need to be jump started (for the third time that day – it clearly does not like the cold). 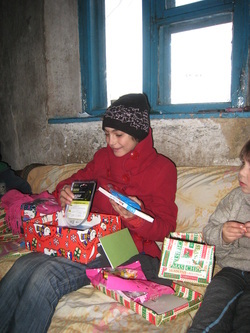 We then travelled back to Balti to empty out the van and leave Slavic with the few remaining shoeboxes we had, which he would later deliver to a centre for deaf children. We then returned to where we were staying to a warm shower and a cuppa. The trek home would start early this morning as we wanted to get to the border (as you can never tell how long the crossing might take). In the end the border crossings were straight forward, with the lorry only taking about 45 minutes on the Romanian side. The drive today across the mountains was very picturesque but as the windscreen wash was frozen in the pipes the window got very dirty which made seeing harder. We drove through a lot of Romania to Targu Mures where we would again meet with Zoltan. Whilst we had been gone Ancy had a baby girl so we were able to have dinner with them and see the new baby. Young Boroka was very excited to see us and show us her new sister. From there we travelled onto Hotel Montana in Heudin arriving around midnight. progress and would drive the rest of the way through Romania and then through Hungary and Austria also. We arrived in Germany late evening where we found a hotel in a small town called Straubing for the night. The aim today would be to drive home, aiming for Calais by early evening. We had a handsome breakfast at the hotel at a respectable 8am before hitting the road. All was going to schedule until about 1.30pm when the battery light came on in the van, followed by all the lights on the dash! Unfortunately we were then stuck in traffic so a quick driver swap round occurred (allowing Cookie to jump in the van as without power steering it was heavy to drive). In the end we had to pull onto the hard shoulder and tow the van to the next services with the lorry. We then started the lengthy process of phoning the RAC and getting home......trust us when we tell you this is a long story....but to keep it short, we left the van in Germany and were given hire cars home (one in Germany and another in England). We now await the arrive of the van back to England! donate shoeboxes and food parcels. Thank you. Poole Hayes School put an article on their website following the childrens contribution of boxes. If you would like to see more photos from the trip then please hover over 'photo gallery' in the left hand menu. A thank you was received from a school in Romania, this can be viewed on the latest news page of our website.